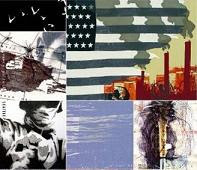 5+5 Gallery, in collaboration with Josh MacPhee and justseeds.org, is proud to present a major exhibition of politically and socially engaged printmaking at 5+5 Gallery. The exhibit showcases print art which uses themes of social justice and global equity to engage community members in political conversation. Originally hung in conjunction with Seattle Print Arts at the Phinney Center Gallery in Seattle, the show has been expanded for this Brooklyn engagement to include even more printmakers. The exhibition features work by over 180 artists from the US and around the world. It is curated by Josh MacPhee, a Troy, NY-based artist, activist and author, most recently of Stencil Pirates: A Global Study of the Street Stencil, published on Soft Skull Press. The exhibition includes work by artists who are primarily activists, as well as artists whose work may not always be politically motivated, but who wanted to respond to the monumental trends and events of our times. If you can’t make the show, you can get a copy of the catalogue online at Just Seeds — it has images of all the work in the show as well as essays by Josh MacPhee Deborah Caplow of the University of Washington on political art and printmaking.